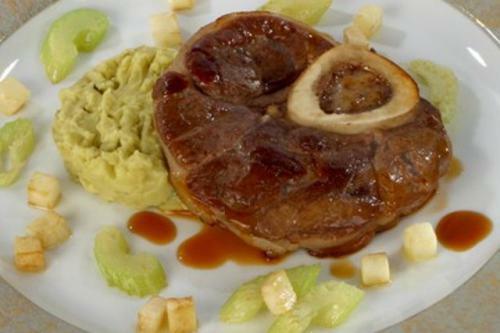 Heat the olive oil in a frying pan and brown the veal shanks. Remove the veal shanks from the pan and sprinkle them with salt and pepper. Soften the garlic, carrot, onion, leek and thyme in the olive oil left in the pan, taking care not to brown them. Add the veal shanks and the meat stock, place the lid on the pan and simmer for approx. 90 minutes until cooked, spooning the liquid over the meat regularly. Remove the veal shanks from the pan. Strain the liquid and mix it with the honey and lemon juice, then dip the veal shanks into the mixture before putting them in a preheated oven at 180C for a further 15 minutes, spooning the sauce over them regularly. In the meantime, cook the celery in the sauce left in the pan. Serve with roasted celeriac cubes and potato and pea mash.